Purpose To develop an evidence-based clinical practice guideline for the prevention of oral mucositis in children (0–18 years) receiving treatment for cancer or undergoing haematopoietic stem cell transplantation (HSCT). Methods The Mucositis Prevention Guideline Development Group was interdisciplinary and included internationally recognised experts in paediatric mucositis. For the evidence review, we included randomised controlled trials (RCTs) conducted in either children or adults evaluating the following interventions selected according to prespecified criteria: cryotherapy, low level light therapy (LLLT) and keratinocyte growth factor (KGF). We also examined RCTs of any intervention conducted in children. For all systematic reviews, we synthesised the occurrence of severe oral mucositis. The Grades of Recommendation, Assessment, Development and Evaluation approach was used to describe quality of evidence and strength of recommendations. 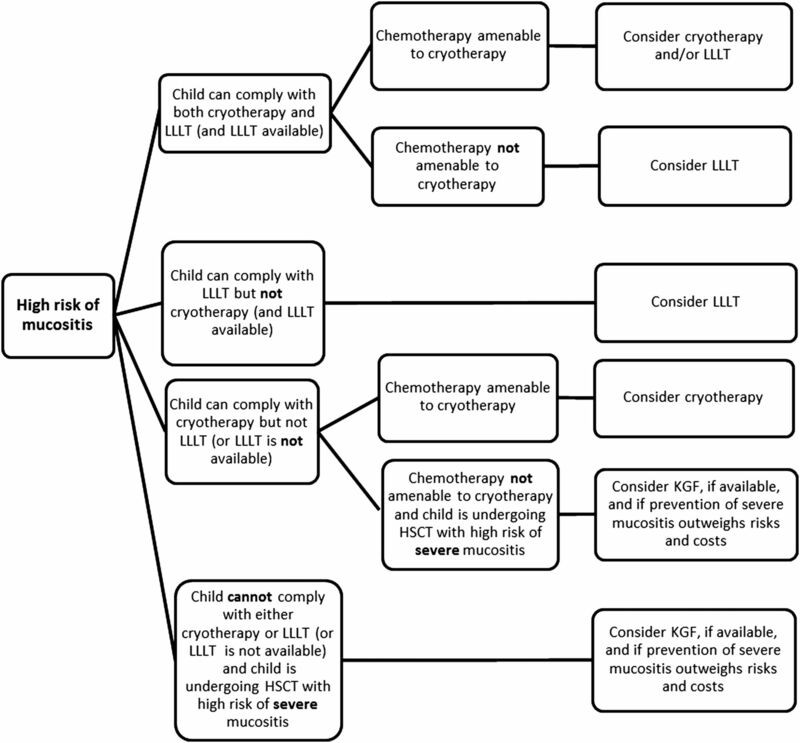 Results We suggest cryotherapy or LLLT may be offered to cooperative children receiving chemotherapy or HSCT conditioning with regimens associated with a high rate of mucositis. We also suggest KGF may be offered to children receiving HSCT conditioning with regimens associated with a high rate of severe mucositis. However, KGF use merits caution as there is a lack of efficacy and toxicity data in children, and a lack of long-term follow-up data in paediatric cancers. No other interventions were recommended for oral mucositis prevention in children. Conclusions All three specific interventions evaluated in this clinical practice guideline were associated with a weak recommendation for use. There may be important organisational and cost barriers to the adoption of LLLT and KGF. Considerations for implementation and key research gaps are highlighted. Oral and oropharyngeal mucositis are important and common consequences of cytotoxic cancer treatment and haematopoietic stem cell transplantation (HSCT) conditioning in adults and children.1 This guideline for the prevention of oral and oropharyngeal mucositis was developed in order to prevent or reduce the severity of mucositis in children 0–18 years of age receiving cytotoxic chemotherapy or radiotherapy for cancer or undergoing HSCT. For the purpose of this guideline, oesophageal mucositis is encompassed by the terms oral and oropharyngeal mucositis; these conditions will be referred to as oral mucositis for the remainder of this guideline for the sake of brevity. We have explicitly excluded lower gastrointestinal mucositis from the scope of this guideline. While oral hygiene is an important component of clinical care, we have not addressed its role in the prevention or reduction of oral mucositis, as good oral care should be encouraged in all children, including children with cancer.6 Reduction or modification of subsequent chemotherapy as an option for secondary oral mucositis prevention is outside the scope of this guideline. The target users of this guideline are healthcare providers who care for children (0–18 years) who are receiving chemotherapy and/or radiotherapy for cancer or undergoing HSCT, and who are at risk of experiencing oral mucositis. This guideline is aimed particularly at physicians, nurse practitioners, nurses, pharmacists and dentists treating paediatric oncology, and HSCT patients. The overall objective was to develop an evidence-based clinical practice guideline for the prevention of oral mucositis in children (0–18 years) receiving treatment for cancer or undergoing HSCT. The Pediatric Oncology Group of Ontario (POGO) Mucositis Prevention Guideline Development Group was formed in March 2014 (see online supplementary appendix 1). Members were selected with a view to obtain interdisciplinary representation from internationally recognised experts in paediatric mucositis and POGO institutions. Panel members completed conflict of interest forms; no members had important conflicts. The guideline was editorially independent from the funding body. There is a large literature base of studies that evaluate oral mucositis prevention in single arm and randomised controlled trials (RCTs) among adult and paediatric populations. Biologically, interventions that are effective in adult populations are likely to have a similar effect in children. However, differences in efficacy may arise related to changing pharmacokinetics and pharmacodynamics, age-related variance in the distribution of receptors for targeted interventions and lack of patient cooperation for some interventions. Specific interventions may have less utility in children if there is limited use of an antineoplastic agent in children when the mechanism of protective activity is agent specific. Toxicities of therapy may also be different and interference with anticancer activity may differ by underlying tumour type. Paediatric studies are also critical to determine dosing recommendations. Consequently, we decided to evaluate the adult and paediatric literature with an emphasis on the appraisal of paediatric studies. In order to limit the scope of the adult and paediatric review, we took a pragmatic approach that builds on work conducted by a recent Cochrane Collaboration systematic review,7 and The Mucositis Study Group of the Multinational Association of Supportive Care in Cancer and International Society of Oral Oncology (MASCC/ISOO).8–17 More specifically, because our health question was to identify prophylactic interventions that are effective at preventing or reducing the severity of oral mucositis, we chose to systematically review interventions that were recommended or suggested in any population by MASCC/ISOO for the prevention of oral mucositis and that showed evidence of benefit in the Cochrane Collaboration systematic review. These interventions were cryotherapy, low level light therapy (LLLT) and keratinocyte growth factor (KGF). Since the best way to evaluate the efficacy of an intervention is through conduct of RCTs, we evaluated RCTs of these agents in any age group and assessed if the effect appeared to differ by adult or paediatric population. We did not conduct systematic reviews of agents that the MASCC/ISOO guideline recommended against using. We also conducted additional reviews restricted to paediatric patients. Because of the potential risk of harm with KGF in children, we undertook a systematic review of any primary study type of KGF use in paediatric cancer or HSCT. Finally, in order to better understand the full scope of the evidence base for mucositis prevention in children, we conducted a systematic review of all RCTs of any intervention to prevent oral mucositis in paediatric patients. If an agent other than cryotherapy, LLLT or KGF appeared promising in children, we had planned to conduct a combined adult and paediatric review of that agent. The search strategies, selection criteria, approach to appraisal and specific search details can be found in online supplementary appendix 2. For all systematic reviews, we synthesised the occurrence of severe oral mucositis when at least three studies reported on this outcome for a specific intervention. Severe oral mucositis was defined as WHO, National Cancer Institute—Common Terminology Criteria for Adverse Events (NCI-CTCAE) V.2.0 or Radiation Therapy Oncology Group (RTOG) scale score of 3 or 4. All these scores use a five-point scale ranging from 0 to 4 in which scores of 3 and 4 represent the worst mucositis. The NCI-CTCAE V.3.0 scale ranges from 1 to 5 in which 5 is fatal mucositis. NCI-CTCAE V.3.0 scores of 3–5 were considered severe. All syntheses used the risk ratio (RR) as the effect measure where ratios less than 1 suggest that the intervention is better than placebo or no therapy. The 95% CI was also described. As we anticipated heterogeneity across studies, a random effects model was used for all analyses. Analyses were conducted using Review Manager (RevMan, V.5.2, Copenhagen: The Nordic Cochrane Centre, The Cochrane Collaboration, 2011). We identified outcomes most important for this guideline. Outcomes of critical importance were severe oral mucositis, mucositis of any severity, pain and adverse events associated with the intervention. Outcomes of lower importance included receipt of opioid analgesia, enteral or parenteral nutrition, infection outcomes and fever, since these outcomes are subject to confounding and institutional variation. We used the Grades of Recommendation, Assessment, Development and Evaluation (GRADE) approach to describe quality of evidence and strength of recommendations.18 ,19 Quality of evidence was evaluated in terms of risk of bias (methodological limitations), imprecision of estimates, inconsistency of results between studies and indirectness (lack of applicability to the target population). In this guideline, indirectness primarily occurred when the data were not paediatric specific. A strong recommendation was made when benefits clearly outweighed the risks and burdens or vice versa. In contrast, a weak recommendation was made when benefits and risks or burdens were closely matched, or when there was considerable uncertainty about the magnitude of the benefits and risks. Each recommendation was carefully deliberated by the panel. Decisions were taken through panel discussions and any differences in opinion were resolved by consensus. The draft guideline was distributed to 12 external experts in adult and paediatric mucositis. Specific recommendations were reviewed by the panel and the guideline was revised accordingly. The guideline development process took 6 months from constitution of the panel to guideline completion. This guideline will be reviewed every 5 years or earlier if important new information becomes available. Online supplementary appendix 3 outlines the results of the search strategies and flow charts of study identification, selection and reasons for exclusion. Table 1 presents the summary of recommendations, strength of recommendations, level of evidence and remarks. Recommendation 1.1: We suggest that cryotherapy may be offered to cooperative children receiving chemotherapy or HSCT conditioning with regimens associated with a high rate of mucositis. Remarks: This recommendation places high value on the possible reduction in mucositis with an intervention with a low risk of harm. It is a weak recommendation because of the lack of paediatric-specific evidence, because the majority of studies that demonstrated the benefit of cryotherapy were conducted using chemotherapy regimens not commonly given to children and because of the methodological limitations of the conducted trials. Regimens appropriate for cryotherapy are restricted to agents with a short infusion time and short half-life. Oral cryotherapy involves placing ice cubes or ice chips in the mouth and continually replenishing fresh ice during the period of cytotoxic treatment (typically 30–60 min). It is an attractive intervention because of its low cost and universal access. In reviewing the evidence tables (see online supplementary appendices 4–6), there have been 14 RCTs conducted of cryotherapy in which 1301 patients have been randomised. In 13 studies, cryotherapy was given during chemotherapy administration and in 1 study, it was given before and after localised radiotherapy to the head and neck. Of the 14 studies, 12 reported a benefit of cryotherapy. Figure 1 illustrates that cryotherapy significantly reduced severe oral mucositis (RR 0.46, 95% CI 0.30 to 0.71; p=0.0005) among the eight studies reporting this outcome. Cryotherapy versus no cryotherapy for the reduction of severe oral mucositis in patients receiving treatment for cancer or undergoing haematopoietic stem cell transplantation. Forest plot of incidence of severe (grade 3 or 4) mucositis in adults and children randomised to cryotherapy, versus no cryotherapy in patients with cancer and those receiving haematopoietic stem cell transplantation. Squares to the left of the vertical line indicate that the intervention reduces mucositis. Horizontal lines through the squares represent CIs. The size of the squares reflects each study's relative weight, and the diamond represents the aggregate risk ratio and 95% CI. In spite of the many RCTs available, the quality of evidence supporting this recommendation was only moderate due to indirectness and limitations in study design. Only one study included children, and the youngest child was 8 years of age.20 This study included adults and children undergoing allogeneic HSCT, and cryotherapy was administered with low-dose methotrexate for graft-versus-host disease (GVHD) prophylaxis. Notably, this study was one of only two studies that failed to show a benefit of cryotherapy. Likely, the conditioning regimen contributed much more to the risk of mucositis than did low-dose methotrexate given for GVHD prophylaxis; thus, this study is difficult to interpret. In addition, the most common regimen used in the studies of cryotherapy was 5-fluorouracil (8/14 studies); this agent is rarely used in children. Indirectness is also a concern as there is likely to be an age at which children cannot or will not comply with cryotherapy during chemotherapy administration. Limitations in study design are also a concern. Online supplementary appendix 5 illustrates that three of the studies were quasi-RCTs. Adequate sequence generation was only present for two studies and it was inadequate in three. None of the 14 RCTs adequately concealed allocation, a major methodological limitation, as lack of allocation concealment has been associated with exaggerated treatment effects.21 Finally, only two studies used blinded outcome assessors. The low quality of the RCTs evaluating the efficacy of cryotherapy for mucositis prevention raises concerns about the possibility of bias. Cryotherapy is only feasible if chemotherapy is administered as a short infusion and has a short half-life. The chemotherapeutic agents used in the studies of cryotherapy were 5-fluorouracil (8 studies), melphalan as conditioning for HSCT (2 studies), a variety of conditioning regimens for autologous and allogeneic HSCT (1 study), and etoposide, cisplatin, mitomycin-C and vinblastine (1 study). It would be reasonable to use cryotherapy for paediatric patients receiving short infusions of these chemotherapeutic agents. In addition, since the biological mechanism underlying the effect of cryotherapy is likely related to reduced distribution of the cytotoxic agent to the oral mucosa due to vasoconstriction, it may also be reasonable to use cryotherapy for other regimens associated with a higher risk of mucositis as long as the regimen is given over a short period of time such as 30 min, and the agent has a short half-life. Flavoured ice popsicles, ice slushy drinks or ‘freezies’ are likely to be more acceptable to children than plain ice. There are two safety considerations with cryotherapy. First, if ice chips are to be used, they may be a choking hazard in very young children, although children who are old enough to comply with cryotherapy are unlikely to be at risk for choking. Second, vasoconstriction of the oral tissues may influence local anticancer activity, although this issue has not been noted in the adult studies. Recommendation 1.2: We suggest that LLLT may be offered to cooperative children receiving chemotherapy or HSCT conditioning with regimens associated with a high rate of mucositis. Remarks: This recommendation places high value on the possible reduction in mucositis with an intervention with a low risk of harm. It is a weak recommendation because this strategy requires specialised equipment and expertise, and it is unknown whether it is feasible to deliver this therapy modality in routine clinical practice, particularly in a paediatric population. The ideal treatment parameters and cost-effectiveness of this approach are unknown. LLLT is based on the physiological effects of low-energy light without thermal generation. The main effects of phototherapy are anti-inflammatory, influence on wound healing and analgesic. While the precise mechanism of action of LLLT in preventing oral mucositis is not fully understood, a number of biological effects have been well characterised at the molecular, cellular and tissue-based levels.22 It is typically administered intraorally, although there is some experience with external application. In the systematic review by Oberoi et al,23 18 prophylactic LLLT studies were identified; online supplementary appendix 7 summarises the type of laser, wavelength, energy and laser schedule. LLLT significantly reduced the incidence of severe mucositis (RR 0.37, 95% CI 0.20 to 0.67; p=0.001). LLLT also reduced the incidence of severe pain (RR 0.26, 95% CI 0.18 to 0.37; p<0.0001). Two studies included children and there was no difference in the effect of LLLT by age (p for interaction=0.90). One study included adults and children receiving autologous or allogeneic HSCT24 while the second study included children receiving chemotherapy or autologous HSCT.25 There was no difference in the effect of LLLT by underlying condition (patients with head and neck cancer receiving radiotherapy or chemoradiotherapy versus patients receiving chemotherapy or HSCT; p for interaction=0.85). The review identified a significant interaction by allocation concealment, with the effect of LLLT to prevent severe mucositis being RR 0.61 (95% CI 0.30 to 1.25) in studies with adequate concealment and RR 0.16 (95% CI 0.07 to 0.41) for studies with unclear or inadequate concealment (p for interaction=0.03). There was also evidence of publication bias with four outlying studies in the funnel plot. When the ‘trim and fill’ technique26 was used to account for publication bias, the effect of LLLT remained significant (RR 0.51, 95% CI 0.29 to 0.90; p=0.0197). In summary, LLLT is effective in reducing severe mucositis in patients receiving treatment for cancer and undergoing HSCT, although methodological concerns and potential publication bias may mean that the treatment effects observed in these trials are exaggerated. Recommendation 1.3: We suggest that KGF may be offered to children receiving HSCT conditioning with regimens associated with a high rate of severe mucositis. Remarks: This recommendation places high value on the evidence of efficacy of KGF in adult populations. It is a weak recommendation because of the lack of efficacy and toxicity data in children, a theoretical concern that young children may be at increased risk of adverse effects related to mucosal thickening and the lack of long-term follow-up data in paediatric cancers. KGF is an epithelial growth factor; it is a 28 kD, heparin-binding member of the family of fibroblast growth factors. The most commonly studied KGF is palifermin, a recombinant human KGF. It is contraindicated in patients with known hypersensitivity to Escherichia coli derived proteins. Online supplementary appendices 8–10 describe the 11 RCTs conducted of KGF; they included 1470 randomised patients. Ten studies evaluated palifermin while one study evaluated repifermin (no longer available). Use of KGF was evaluated in the context of HSCT conditioning (5 studies); chemoradiotherapy for head and neck cancer (3 studies); and chemotherapy alone (3 studies). Of the 11 studies, 9 reported a benefit of KGF. Figure 2 illustrates that KGF significantly reduced severe oral mucositis (RR 0.81, 95% CI 0.67 to 0.97; p=0.02) in the eight studies reporting this outcome. Primary toxicities were related to the pharmacological properties of the agent with thickening of the oral mucosa and altered taste sensation. The quality of these studies was high and all studies were placebo controlled. All 11 trials were sponsored by a pharmaceutical company. Only one study included children, and it evaluated KGF for the prevention of GVHD following allogeneic HSCT in a mixed adult and paediatric sample.27 Mucositis severity was evaluated as a secondary outcome and a significant reduction in the mean severity of oral mucositis with KGF compared with placebo was observed (WHO 2.3 vs 2.8; p=0.01). In a long-term follow-up of this study, no difference in invasive fungal infection, chronic GVHD, or overall survival between the KGF and placebo cohorts was evident at 2 years.28 However, relapse rates were not described, few patients had solid tumours (number not specified) and outcomes were not specifically reported for paediatric patients. Keratinocyte growth factor (KGF) versus no KGF for the reduction of severe oral mucositis in patients receiving treatment for cancer or undergoing haematopoietic stem cell transplantation. Forest plot of incidence of severe (grade 3 or 4) mucositis in adults and children randomised to KGF versus no KGF in patients with cancer and those receiving haematopoietic stem cell transplantation. Squares to the left of the vertical line indicate that the intervention reduces mucositis. Horizontal lines through the squares represent CIs. The size of the squares reflects each study's relative weight, and the diamond represents the aggregate risk ratio and 95% CI. We made a weak recommendation that KGF may be considered for children undergoing HSCT if the benefits of mucositis prevention outweigh the risks and costs. If used, KGF should be administered at a dose of 60–90 µg/kg/day for 3 days prior to conditioning and 3 days following stem cell infusion. Other growth factors, glutamine and Traumeel S, were not consistently effective in reducing mucositis in paediatric patients in more than one study. Single studies of topical vitamin E,37 transforming growth factor-β2-enriched feeding,38 chewing gum,39 chlorhexidine gluconate,40 sucralfate41 and a preventive oral disease protocol42 were not effective in reducing mucositis. Given that our focus was on the identification of effective interventions to prevent or reduce mucositis, we did not make strong or weak recommendations against the use of any of these agents. Recommendations against the use of an agent would require adult and paediatric systematic reviews and the development of specific criteria on which to make such a recommendation. However, the identification of ineffective interventions is an important area for future research and is identified as a research gap. In this guideline, we identified three interventions that may be appropriate for mucositis prevention in children. Figure 3 illustrates an algorithm for strategy implementation consideration. All three specific interventions (cryotherapy, LLLT and KGF) evaluated in this clinical practice guideline were associated with a weak recommendation for use. Since all systematic reviews compared the intervention against placebo or no therapy, it may be helpful to compare the RRs to gain insight into prioritisation. The RR against placebo or no therapy for LLLT, cryotherapy and KGF were 0.37, 0.46 and 0.81, respectively. In evaluating all three interventions, KGF is an intervention associated with high costs and a potential for harm. In contrast, cryotherapy is associated with very few costs and little risk of harm. On balance, if all three interventions are available, and clinically relevant, cryotherapy or LLLT should likely be prioritised for implementation whereas KGF should be used carefully in individual patients after weighing risks and benefits. There may also be important organisational and cost barriers to the adoption of LLLT since it requires specialised equipment and training for those who will administer therapy. Suggested implementation approach for the prevention of oral mucositis guideline recommendations (HSCT, haematopoietic stem cell transplantation; KGF, keratinocyte growth factor, LLLT, low level light therapy). Dissemination of this guideline will be an important step in effective knowledge translation. We plan to disseminate this guideline through peer-reviewed publication, presentation at conferences and through paediatric oncology and dental organisations. Research gaps are highlighted in box 1 and include identification of chemotherapeutic agents appropriate for cryotherapy. Important research gaps related to LLLT include better mechanistic information on how the modality could be effective, determination of ideal treatment parameters and comprehensive long-term adverse-effect evaluation, since enhanced bone growth has been reported in preclinical studies.49 ,50 For KGF, research is needed to identify the optimal KGF dose and its short-term and long-term toxicities in paediatric patients. Data related to compliance and cost-effectiveness are needed for these strategies. More paediatric evidence is required to evaluate existing and new interventions to prevent or reduce the severity of mucositis particularly since some children at risk for mucositis, especially infants and very young children, will not be eligible for any of the interventions identified in this guideline. Another important gap is the identification of ineffective interventions to prevent mucositis in children. In randomised trials, equivalence trials require larger sample sizes than superiority trials because the minimal clinically important difference (in superiority trials) is larger than the margin of clinical equivalence. In synthesising trial results, it is unclear how much information is required before concluding equivalence in efficacy outcomes. Similarly, it is unclear how much information demonstrating lack of benefit is required before panels can recommend against use of an agent for interventions without meaningful harms or costs. Finally, how panels should weigh indirect adult evidence in making paediatric recommendations against use of an intervention is another question. Among these research gaps, research priorities that should be addressed early include the identification of paediatric anticancer treatment protocols appropriate for cryotherapy, feasibility of cryotherapy and LLLT in clinical practice, and child preferences for these strategies. The authors would like to acknowledge the assistance of Elizabeth Uleryk, Director, Hospital Library, The Hospital for Sick Children with the literature searches and the administrative/research assistance of Sandra Cabral and Amanda Celis. They also wish to thank the following individuals for assisting with translation: Amanda Celis, Hisaki Fujii and Olena Shatokhina. The authors also gratefully acknowledge the following content experts who externally reviewed the guideline: Dr Victor Aquino, Dr Carlton Brown, Dr Camila Merida Carrillo, Dr June Eilers, Dr Dorothy Keefe, Dr Rajesh Lalla, Dr John Levine, Dr Michael Nieder, Dr Doug Peterson, Dr Sérgio Petrilli, Dr Juliana Castilho Chaves Rojz and Dr Stephen Sonis. They would also like to acknowledge the Pediatric Oncology Group of Ontario for providing research support.
. Oral complications of cancer therapy. In: De Vita VT Jr., Hellman S, Rosenberg SA, eds. Principles and practices of oncology. Philadelphia: Lippincott-Raven, 1993:2385–94. American Academy of Pediatric Dentistry. Policy on oral health care programs for infants, children, and adolescents. Oral Health Policies, 2011.
, eds. Cochrane handbook for systematic reviews of interventions, Version 5.1.0 [updated March 2011]. The Cochrane Collaboration, 2011.
. Transient oral cavity and skin complications after mucositis preventing therapy (palifermin) in a patient after allogeneic PBSCT. Case history. Adv Med Sci 2006;51(Suppl 1):66–8.
. Use of recombinant human granulocyte colony-stimulating factor to increase chemotherapy dose-intensity: a randomized trial in very high-risk childhood acute lymphoblastic leukemia. J Clin Oncol 2000;18:1517–24.
. Effectiveness of oral chlorhexidine for reducing stomatitis in a pediatric bone marrow transplant population. Pediatr Dent 1989;11:37–42.
. Oral-disease prevention in children with cancer: testing preventive protocol effectiveness. Medicina Oral 2001;6:326–34. Correction notice This article has been corrected since it published Online First. The Open Access licence has now been added. Contributors LS, PR and LLD contributed to the conception and design, collection and assembly of data, data analysis and interpretation, and manuscript writing. NT, TB, PG, WT, JW and JB contributed to the interpretation and manuscript writing. All authors approved the final manuscript. Funding Funding support was provided by the Pediatric Oncology Group of Ontario. LS is supported by a New Investigator Award from the Canadian Institutes of Health Research (Grant no. 87719).